Last week, I posted my thoughts on Michael Wilbon’s view of the wedding registry as the purview of the bride-to-be. 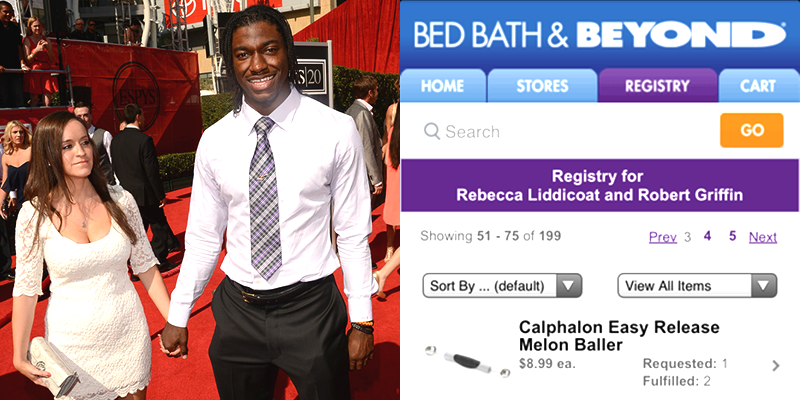 I moved fairly quickly past the story that inspired his declaration: fans’ purchase of all of the items on Redskins quarterback Robert Griffin III’s Bed, Bath, and Beyond wedding registry, and RGIII’s subsequent decision to keep the gifts. Some of the feedback I’ve received suggested the need for a more in-depth discussion of what, exactly, is going on with average people going to a millionaire sports celebrity’s registry and thinking it’s appropriate to send that person bath mats, cake pans, and flatware. Fair enough. Dan Steinberg of the Washington Post connects Redskins fans’ impulse to a very specific view of modern American sports culture: http://www.washingtonpost.com/blogs/dc-sports-bog/wp/2013/05/24/rgiii-cake-pans-wedding-registries-and-fandom/. Steinberg, admitting that purchasing a gift for RGIII makes no logical sense, argues that this is the nature of the emotion fans invest in their sports heroes. RGIII, who has meant so much to fans of a struggling franchise, has inspired hope and passion, and the gifts both connect fans to the star and allow them to express their thanks. While I personally think fans’ willingness to purchase high-priced NFL tickets and gear (not to mention RGIII’s $21 million, 4-year contract and numerous lucrative endorsements) communicate “thanks” fairly effectively, Steinberg’s point about the desire to find connection with an admired figure is not wrong. For me, there are larger points about celebrity and celebration to be made. First of all, in contemporary American culture, especially with the 24-hour news cycle, fast-paced world of internet updates, and pervasiveness of social media (as of this morning, RGIII has 918,897 Twitter followers), the public has near constant access to the actions and even the inner-thoughts of their favorite celebrities (sports-related or otherwise). And RGIII has played the fame game brilliantly. So even though it is unlikely that fans sending gifts might ever meet RGIII, they can feel as though they know him. And this sentiment crosses lines by which people achieve fame (fans “like” or know they’d be “best friends” with certain public figures – based on the images presented by those figures and often reinforced by media treatment).